The Southern California Sand Drag Association (SCSDA) kicked off the 2016 in grand style as the west coast racers returned to the Soboba Casino in San Jacinto, CA for SCSDA’s Season Opener event. 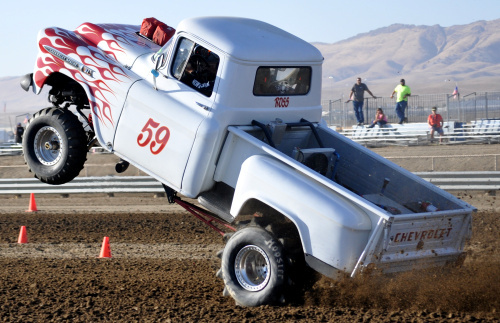 This would be the first sand drag race back at the fabled Soboba Casino venue since November of 2013, and the overall feel was extremely enthusiastic from all in attendance. A great turnout of racers showed to compete on the 300’ and put on a great show for a stellar spectator crowd that was in attendance throughout the weekend. A huge thank you needs to go out to sand drag racing legend Larry Minor, who put in a huge effort to ensure the return of sand drags to his back yard, the Hemet/San Jacinto area. Here’s a rundown of all the on track action for the weekend. The countdown continues getting shorter as the sand drag community readies for the Avenal Sand Drags Spring Nationals in Avenal, CA on April 23-24. NSDN will be on-site with full coverage from this event. Click HERE to view the event flyer. Here is just a taste of the action from last fall's event with Top Eliminator 2.95 Index eliminations. For more info on this event, go to www.AvenalSandDrags.com. The 2016 season at Atoka Motorsports Park is underway with both the March & April point series events in the books. Among the highlights to start the season is Danny Mathews sweeping both events in the Pro 1 Cars money class. He’s off to a hot start in the season points battle. One new name sits atop the points sheet after two races and that is Pro 2 Quads racer Jerry Johnson, who took the class win at the April event. Next up for AMP is Points Event #3 on May 14, followed by the 18th Annual Heartland Nationals May 27-29 (Memorial Day Weekend). Click "Read More" to view the full results from the March & April events.